Hugs and continuing to think of all of you! Nothing better than baby toes -- especially ones framed in loving Mimi stitches and lace! May today bring answered prayers and healing to baby's mommy. Oh, how sweet!!!!! I know her mommy wants to kiss those sweet toesies! 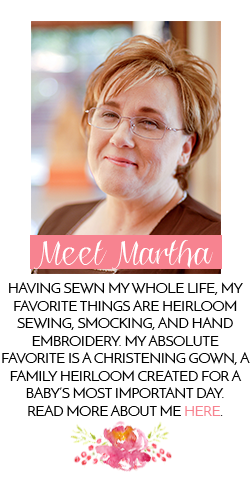 Prayers continue, Martha! oh my! be still my heart. What sweet little piggie toes! I'm glad you're there, Martha. You needed to be!! Exquisite photo! Those toesies are downright munchable. Martha, I am so so sorry to hear of your daughter's difficulties and know that she is in my prayers. 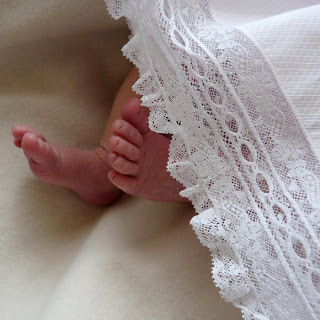 Awe, cute little toesies and beautiful lace !!! Continued prayers for Evemarie's mommy. Scrumptious! This makes me smile! How can I ever mark this as read on my Google reader? Enjoy! Love em... I constantly have your family in my prayers and on my mind. This is the absolute most wonderful picture. You just want to kiss those little toes. Martha, your baby girl is gorgeous. The picture of the toes is so dear! She is surely going to be the best-dressed baby ever and I hope we get to see her modeling your creations often.